A Revenue 'Trigger' Would Shoot Down Tax Cuts If Economy Doesn't Grow As Expected Some senators want the tax overhaul to come with a built-in trigger: If budget deficits grow, tax cuts will be reversed. But several key senators strongly oppose the idea. Republicans lawmakers are considering a federal budget "trigger" that would raise taxes if proposed tax cuts don't deliver the economic growth they have promised. But the proposal is generating a lot of pushback from critics, especially conservatives. The so-called trigger mechanism would be a legislative provision to rescind corporate tax cuts by as much as $350 billion if revenue targets are not met, Bloomberg News reports. Congressional Republicans have said they expect the tax cuts to unleash a wave of economic growth, which will boost tax revenues and keep the budget deficit from increasing. The trigger would kick in if that doesn't happen as promised. While few details have been released, the aim would be "to try to create a backstop or a trigger mechanism that to the extent that growth estimates that have been laid out aren't achieved, we don't pass on even greater debt to our children," Sen. Bob Corker, R-Tenn., told Fox News on Tuesday. But the idea is opposed by many economists, who say it could force Congress to raise taxes in the middle of an economic slowdown — which they say is exactly the wrong time to do so. "I'm concerned that if we hit a downturn, then we could have these automatic tax increases, and that would actually make a recession worse," said Gus Faucher, chief economist at PNC Financial Services Group. Lawrence Summers, who was Treasury secretary in the Clinton administration, said, "You'll deliver the economy a body blow, reducing consumption and reducing investment, just at the moment you most need to be encouraging [it]." Summers also expressed doubt that Congress would actually implement a trigger during a recession, when the political pressure to keep taxes low would be especially strong. "This kind of gimmick is the reason why Congress has single-digit popularity ratings," he adds. The trigger has also been criticized by a number of business and conservative groups, including the U.S. Chamber of Commerce and Americans for Prosperity, which is funded by the Koch brothers. Romina Boccia, deputy director for economic policy studies at the Heritage Foundation, says the trigger would leave businesses uncertain about the future, undermining the potential benefits of the tax cuts. "Including a potential tax increase through a trigger or by any other means creates uncertainty, which will lower the overall economic growth we can expect to see from the tax plan," Boccia said. Several GOP senators have also expressed doubts about the trigger, including Iowa's Charles Grassley and Thom Tillis of North Carolina. John Kennedy of Louisiana was quoted as saying he would rather "drink weed killer than vote for the thing." 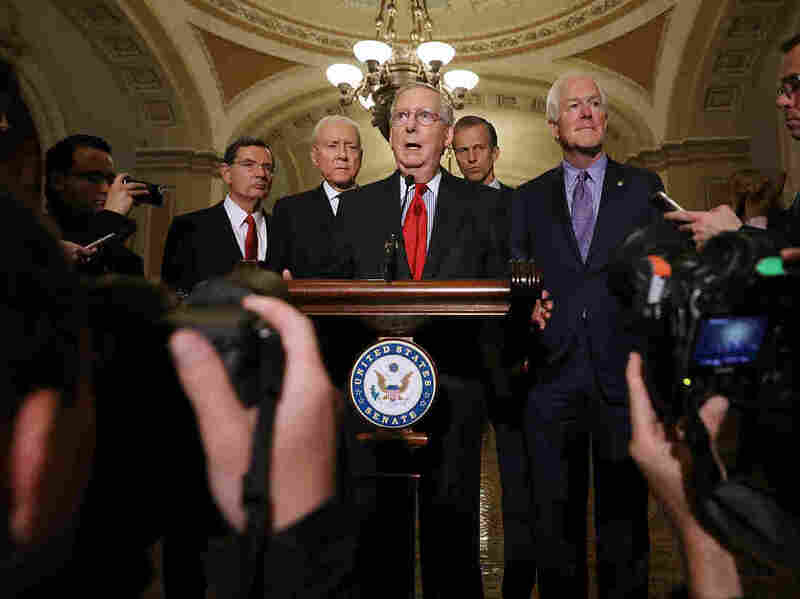 But it was not clear whether their opposition would be enough to kill the trigger, and congressional Republicans are reportedly still talking about ways to keep the idea on the table. "We are probably going to have one but I prefer not having it," Utah Sen. Orrin Hatch told reporters. "It depends on how the bill is written. There's a way I would support it." A previous version of the story said Lawrence Summers served as Treasury secretary in the Obama administration. He was Treasury secretary under President Clinton.